Welcome to The Chapel website. When the Haymarket Meeting Hall (now The Chapel) closed as a place of worship in 1997 I knew it would make a fine music room and rehearsal space but I had not considered at that time that it might be suitable for concerts. However, over the years it has proved to be an excellent performance space for classical chamber music. Its intimacy and acoustics have become popular with professional musicians and audiences alike since it creates the sort of conditions that would have existed when the pieces were first performed. Do come along and treat yourself to the experience, I don’t think that you will be disappointed. The exterior of the building from Park Lane is exactly as it was when Augustus Scott, the architect, supervised its erection in 1890. The history of the site and the personalities involved are set out below. Outbuildings, including a schoolroom, at the rear have been demolished and the interior of the chapel has been redecorated and modernised with the installation of a heating system and new lighting. James Spilling purchased the site in 1890 in the name of the “Trustees of the Norwich Society of the Doctrines of the Church of New Jerusalem”, and at his own expense commissioned the architect Augustus Frederic Scott (1854-1936) to design and build a chapel for the use of the Swedenborgian sect. A schoolroom building was added at the rear in 1895. The building was renamed the New Jerusalem Church but the sect gradually lost followers and in 1925 the building was sold to the Church of Jesus Christ of Latter Day Saints, Salt Lake City and became the home of the Mormons in Norwich. When the Mormons moved to their new place of worship at Greenways, Eaton in 1964 they sold the chapel to the Haymarket Meeting Group and it remained their place of worship in the city until the congregation dwindled and it was closed in 1997. James Spilling, lived at No 30 Park Lane and was Editor of the Eastern Daily Press from 1872-1897. He was well known for his portrayal of Norfolk humour and dialect. His books on the subject, Giles Trip to London, Molly Meggs Trip to the Seaside, The Cockneys in the County, Jack Hawkins First Vote and Arry and Arriet had a circulation of over a million copies. His more serious writings dealt with the life and beliefs of Swedenborg and he preached regularly in the original rooms of the Swedenborgian Society in Elm Hill. "James Spilling, whom the whole New Church regrets to lose as a worker and writer in the great cause of the spread of the heavenly doctrines, was born at Ipswich in 1825. He received his education at one of the public schools of that town, and, on completing his period of schooling, was apprenticed to a bookseller and publisher. As even in his earliest years he had shown that he had more than the ordinary activity of intellect, he now found himself in a sphere where that activity could find channels in which to flow. He availed himself of his opportunities to undertake an extensive course of reading, and he even had occasion to exercise his pen in various directions, though none of them of very great importance. Together with a number of young men also capable of thinking deeply and feeling strongly, he developed views of the most fervid radicalism in politics, and of skepticism in religion. He became a student of the writings of Voltaire, of Thomas Paine, and others; he was instrumental in founding a freethinking association called the Ipswich Utilitarian Society, afterwards introduced into one of his stories as the "Society of the Daring Doubters." Of this he was for a long time a leading spirit, and it was as a debater in the meetings of this association that he acquired that gift of speech which distinguished him for the rest of his life. With riper years his views underwent considerable modification, and he was gradually led, even though retaining their views, to disconnect himself from the companionship which he had made in this society. The incident which brought about Mr. Spilling's acceptance of New-Church truth--if indeed it did not for the first time bring it under his notice, is of some interest. One of his skeptical friends showed him a copy of Edward Richer's well-known work, The Religion of Good Sense, which had been lent by a New Churchman, and inquired if he would like to read it; and as Mr. Spilling had just before this read with great interest Emerson's lecture on Swedenborg contained in his Representative Men, he gladly accepted the offer. The course of the arguments contained in it made a great impression upon his mind and created a desire to discuss its principles with some of those who held them. At the time, the meetings of the Ipswich New-Church society were suspended, although the friends had a small place of worship there. Arrangements were however made to form a reading and discussion class, among the members of which was Dr. Goyder of Bradford, and of which Mr. Spilling was appointed Secretary. The readings and discussions were held weekly for a long period, but it would seem that the aggressive and disputative spirit which he had acquired whilst he was connected with the Utilitarian Club was for a long time a barrier to his acceptance of the truths of the New Church; a state of mind which afterwards he found often described in the writings of Swedenborg. One evening however, an earnest and enthusiastic member put the first volume of the Arcana Coelestia into his hands, and begged him to read it and the other eleven volumes of the work. This was the turning point in his mental career. The arguments of the skeptics were brushed aside like cobwebs. And now having relinquished his antagonism, Mr. Spilling became a devoted and constant student of Swedenborg's writings, and rapidly acquired a full and comprehensive knowledge of the doctrines which they unfold. The Ipswich society having re-begun its public worship, aided by a course of missionary lectures given by the Rev. D. G. Goyder, which he heard, he applied for and was received into membership in that society. The Rev. D. G. Goyder, who soon afterwards accepted a call to the pastorate of the Norwich New Church, was succeeded as leader of the Ipswich society by Mr. Spilling, who ministered to it with much success. His early preaching was marked by vigor and earnestness; and he continued for a few years to minister to them to their great satisfaction, and during that time gained the entire affections of his people. He also occasionally visited the Norwich society in order to preach and lecture, and thereby became favorably known in that city. In 1863, when a failure occurred in the business at Ipswich, where he was engaged as a reader for the press, he was invited to accept a position on the editorial staff of the Norfolk News. This offer he accepted, and after a time he often undertook preaching in Norwich, although he was not regarded as the leader. About this time he visited several places to preach and lecture, Glasgow, which was without a minister, being among the number. Here the matter of his discourses gave the greatest satisfaction, but his East Anglian pronunciation was regarded as a drawback to his selection as its minister. In 1866 some friends from Lowestoft visited Norwich, and invited Mr. Spilling to undertake a course of missionary lectures in that town. He agreed to do so on the understanding that he should go but once a month. The Assembly Rooms there were engaged; and his first visit produced a marked impression, the congregations on both occasions being large and attentive. The friends felt, however, that an interval of a month was too long. and Mr. Spilling was induced to agree to go every fortnight. At the third visit the place was crammed; many persons being unable to gain admittance. It may be of interest to know that the lectures were printed, and that the series now form the admirable little missionary volume known as Things New and Old. It was thereupon determined to build a place of worship. Subscriptions were invited, and mainly through the liberality of Mr. W. R. Seago, the church was built and opened for worship in about six months after Mr. Spilling's first visit. Mr. Spilling remained the leader for seven years with unvarying success, and then owing to the great increase in his editorial duties by the inclusion among them of the Eastern Daily Press, he was compelled to sever his connection. With Mr. Spilling's resignation of the leadership of the Lowestoft society, his literary career in connection with the New Church began. The only work which he had published before that was Scripture Emblems Taught in the Household; by a Sunday-School Teacher, which still holds its place as one of the most simple and effective little books on correspondence ever published. In 1877 appeared The Evening and the Morning: A Narrative. It was issued anonymously, and was quite a new departure in New-Church literature. It was, for a New-Church book, a phenomenal success, and has been extensively circulated by private persons and missionary institutions as a most useful missionary work. No doubt the form of fiction into which his matter was cast induced a much larger number to read it, than could have been had for the same arguments and the same teaching in any other form; and this indeed applies to the whole series of Mr. Spilling's New-Church stories. As is often the case, Mr. Spilling's first work was also his best and his most popular. It is a pleasant tale as a tale, and is brimful of subtle reasoning against the positions held by the skeptic. In Amid the Corn we have much information about the Bible, and the correspondences which it contains, given in the pleasantest of manners. An ideal Church was sketched in Our Society, an ideal which we believe is not, however, likely soon to he realized. Me and Mine deals with the correspondences in the human body, its various organs being explained in the course of an interesting narrative. Other works are, The Wreath and the Ring; Charles Robinson: An Episode in the History of a Soul; and Among the Flowers. The latter was written at the request of the Editor of the New-Church Messenger, and first appeared in its columns. This is thought very highly of by all, while some regard it as Mr. Spilling's masterpiece. It deals with the Christian graces and cardinal virtues, and is unmistakably a very beautiful book. We may mention that The Evening and the Morning has been translated into Swedish and Icelandic, although as yet only the Swedish translation has been published. A Welsh translation of Things New and Old has been issued, and a copy has reached us since his decease. As a man and as a writer he was one of whom the New Church may justly be proud. He has now been taken to a higher sphere, where he will again rejoin his beloved wife, and where the love of use which possessed him, and the abilities which he showed so conspicuously here, will find larger scope for their exercise. Though lost to the Church militant on earth, he is a gain to the Church triumphant above. And still he will continue by his books to do much excellent work in this world to spread the cause he loved so well, for a very long time to come." Augustus Frederic Scott (1854-1936) was an eminent architect from a strong nonconformist background and much of his practice, both local and national, was concerned with the design of Free Churches. 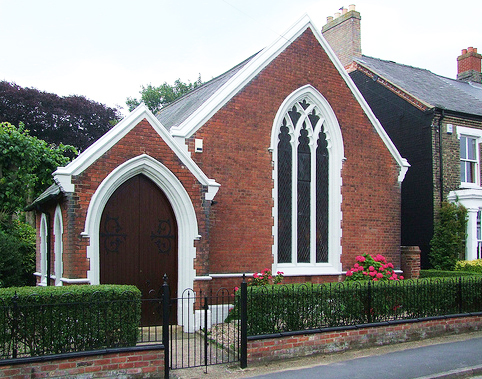 His principal surviving buildings in Norwich are the Jonathan Scott Memorial Chapel, Thorpe Road and the Dereham Road Baptist Church. He was born in 1854 in the Breckland village of Rockland St Peter, Norfolk. His work included both civic and ecclesiastical buildings, in addition to several large hotels and many private commissions. His father was a Primitive Methodist minister called Jonathan Scott. Following the completion of his training he settled in Norwich where he opened up his own practice. His two sons joined him in the business in 1912. Scott was a very principled man. He was a practicing Primitive Methodist and a strict teetotaller. He was also a strict vegetarian on moral grounds and a Sabbatarian. He disagreed with paying the part of his local government rates which funded Anglican schools and when bailiffs removed his paintings, he would buy them back again. As a Primitive Methodist he also became a local preacher and enthusiastic cyclist, he travelled thousands of miles by bicycle and even cycled to London for business on several occasions. He also, at his own expense, maintained a Chinese missionary in Western China. In 1920 he became embroiled in a dispute with Percy Carden the minister at Scott Memorial Church. As a resulted of the dispute Scott and his family permanently severing relations with the church. In 1877 following the arrival of the railway to the North Norfolk town of Cromer. Scott operated a practice in Cromer to exploit the building boom on the North Norfolk coast at that time. He designed many of the now listed and important unlisted buildings in Cromer such as the Baptist and Methodist Chapels, the Cliftonville Hotel, Eversley Hotel, the churchyard wall and a number of shops and houses on Church Street and Cliff Avenue. Emmanual Swedenborg (16881772) was a Swedish physiologist who devoted his life to theological studies following a ‘vision’ which he said he experienced in a London Inn in 1745 giving him the power to converse with spirits and angels. He set out his beliefs in an 8 volume publication entitled Arcania Coelestia. The Swedenborgian Society was founded in London in 1810 and, in Norwich was almost immediately denounced from the pulpits, but some years later he obviously developed a following in the area.